This is a Guest Post from Bike Auckland’s Max. It first appeared here and is reproduced with permission. Bikeways must be included in LRT projects, both to and along the future routes. Public transport travels on fixed routes, but everyone’s start and end points are different – so how people cover the ‘last mile’ is key. Walking is great, but bikes extend your range from a few hundred meters to a few kilometres. That makes bikes a perfect strategic combo with LRT. So we need bike paths to future LRT stations, and great bike parking in the vicinity. LRT projects involve really major streetscape upgrades – so are a one-off opportunity to improve the often horrendous bike safety on these roads, and to ensure local access. Running along main roads and through town centres, LRT tends to go exactly where people also want to ride to for shopping, for entertainment, or to local schools, workplaces, and other destinations. So we need proper bike conditions along LRT routes. We’ll discuss biking to stations in a future blog post. For now, we want to talk about that second point – biking along LRT routes – and in particular, the Central Isthmus/ Dominion Road section of the city-to-airport route. The Isthmus LRT route as currently proposed. Why are we zooming in on biking along? Not because biking to is less important, but because along is so much harder to get right after the thing is built. You can always add feeder bike paths to the LRT later – sprouting branches off the main trunk, if you will. We’d love those connections to be part of the initial schemes of course, but nothing is cast in stone or prevented if a new LRT project doesn’t have them. And once the tracks are in place and the trains are running, the argument for these bike paths will only get stronger. Not so for bike facilities along a LRT route. Light rail projects are costly, and involve years of construction disruption for traffic, residents and businesses – particularly when they’re being threaded through historic town centres like those on Dominion Road. After the project is finished, good luck getting any further significant change to the street layout for a couple of decades. Meanwhile, this route is currently used by many people on bikes for good reason: it’s a direct north-south route through the heart of the isthmus and one of the city’s longest strings of shops. It’s a place to be, and the route to ride. Unfortunately, the current plans for LRT routes do not seem to take bikes into account! Our repeated requests for discussion with AT’s LRT team have resulted in… crickets. (The team, sadly, has a reputation for being a silo even within AT, to the point where it’s clear that AT senior leadership has instructed them to keep their cards very close to their chest). No bicycle paths on Dominion Road. And this is one of the wider town centres (Mt Roskill). So we have ONE chance to get biking along LRT routes right. Below, we explore how that might work. Being and feeling safe. That means you need either physical protection from vehicle traffic – or you need to bring down both traffic speeds and volumes. And for pedestrian safety and comfort, you also really don’t want to force bikes into the footpath space. Direct and flowing. That means not putting people on back routes that zig-zag through the suburbs. What people really want is to visit shops on the main street, or get to the next suburb without having to add several kilometres in twists and turns. It also means not mixing bikes and pedestrians, as that will simply hobble convenience and safety for both. A route through an urban area like the Dominion Road section of the future LRT doesn’t offer the ability to tidily place people on bikes on a parallel path, the way our motorway bike routes do. So bikes need to be integrated on Dominion Road itself, not sent somewhere else. And the ‘alternative’ back street routes for bikes are a bad compromise – as we argued last time Dominion Road underwent a streetscape revamp as part of an earlier proposal to upgrade the street for buses. Somewhat ironically, these back street bike routes were the only part of the project that was actually completed. But those streets still have too much traffic, vehicle speeds are too high, and the routes are far too circuitous and illegible to see much use. While we understand the numbers of people biking on these routes have increased somewhat, they’re still far from best practice, all-ages-all-abilities routes – and they don’t go where people want to go (neither through nor to). So again, decent biking provision as part of the LRT scheme needs to be ON Dominion Road. And at least wherever possible, it should be in the form of protected bike lanes. Most of all, we want it because people on bikes want to go to exactly the same places people on cars, foot and LRT want to go: to the main street! And that, in this case, means to the town centres of Dominion Road. Yes, some will also simply be passing through, on their way to the City Centre or elsewhere – including many of the current riders. A city that takes cycling seriously tries hard not to make places like town centres inaccessible by bikes. And, when it comes to otherwise laudable goals like ‘we need this space for better public transport’, a city that understands how bikes amplify public transport will find a way to provide for both, simultaneously. There’s numerous schools on Dominion Road. Just one more destination for local bike trips that need safe infra. That’s thousands of students who could potentially bike to school, taking potentially thousands of cars off the roads every morning and afternoon. Sure, some of those trips can use back streets. But if you essentially exile kids on bikes from Dominion Road by not providing safe bikeways, many schools will just be too hard to get to on a bike, e.g. if you have to go all the way round a long block to avoid the main road. As we can see from Europe, LRT and all-ages biking can be combined on main streets not just efficiently, but beautifully. How can we do it on Dominion Road? The typical cross-section along Dominion Road is 22.6m (based on the surveys during the 2010s bus route project). At some town centres, this reduces to a typical 20m (though at Mt Roskill it actually widens to 24m). This carriageway width is the main limitation we have to work around: there’s only a very finite amount of space. Parking is often something people fight to preserve – but really, if your goal is to keep on-street parking on Dominion Road, you can’t change anything. Even the 2010s bus route project proposed removing all of the parking, which it balanced by adding more in side streets. An LRT project will be even more attractive for retailers who understand cities with thriving LRT / tram systems, so if anything, LRT means less need for on-street parking on Dominion Road than in the busway project. In the town centres especially, footpath widths need to be more than just ‘acceptable minima’. Right where the road gets narrower, the need for pedestrian space increases too. The LRT seems all but certain to run along the middle of the road on its own right of way, likely a slightly raised median or grass strip. This is so it doesn’t get caught up in the same congestion it’s intended to avoid in the first place; and so people can left-turn into their driveways without needing to cross the tracks. But this also means that at every station, the LRT will need platforms in the middle of the road so people can enter / exit the tramcars – you can’t board from the footpath. 22.6m is the typical minimum width for much of Dominion Road. A bikeway works together well with everything else. Now, we don’t know exactly how much width any chosen LRT design will requires, but 3.6m each way appears to match typical requirements (some could be even narrower, but let’s be pragmatic). The good news is that it does work. Our typical Dominion Road mid-block can fit everything – good footpaths, separated bike lanes, car traffic lanes and of course the LRT. The bike lanes wouldn’t have any significant buffer space, but are reasonably wide and would be raised up on a kerb level to protect against encroaching drivers. The trees would need to have tree pits that extend under the footpath and the bike lane, so there’s enough growing space to become substantial trees in the long run. But that’s the benefit of a whole-street revamp, you can do these smart things. Off-set stations limit the platform width requirement to one at a time (works mid-block too). Will this give us enough space to fit everything in? At a staggered station – getting tighter, but bikeways still work! Now, as you can see, things work – but are a little tighter. As much as we’d prefer consistent widths, we suspect that bike lanes through the station sections would need some narrowing. While 1.2m is definitely narrower than desirable, the bike lane would still be slightly raised above traffic and thus feel safe. If one rider wanted to overtake another, they’d definitely need to dip onto the road – or just wait until they’d passed the station, of course. And with a single traffic lane through here, it will be easy to slow down adjacent car traffic. Even without bikes, the town centre section gets so tight, pedestrians also feel the pinch. Not good. Option #1. As you can see, even with one LRT stop (staggered, as discussed above) and even withoutbike lanes, trying to fit LRT through the town centre will be difficult. Unless the designers are able to really narrow the LRT corridor below the 3.6m shown, there won’t even be enough space for proper town centre footpaths. It would feel mangy and mean – not the kind of upgrade a village needs! Plus, people on bikes would have to ride on-road through here. While it would be easy to keep traffic speeds down to 30 kph (or maybe even 20 kph), it wouldn’t be nice. Reasonably safe, given single lanes and no turning traffic – but not nice or all-ages friendly. Moving the stops to the ends of the town centres. Bad for passengers, better for footpaths, but still no bikeways! Option #2 would be to keep the stations out of the narrower village centres. Though this isn’t ideal from a public transport perspective, you could position the LRT stops at the edge of the centres – and, where the run of shops is longer, you could have a stop at each end (Balmoral North and Balmoral South, say) to reduce walking distances to the shops. Where are the bike lanes in this one? Still missing – because, realistically, where there’s a shopping and people hub, footpaths need to be wider than 2m, as per Option #1. And once those footpaths are set at a more sensible width, even removing the station leaves no space for traffic lanes AND bike lanes. Ironically, we suspect this could be an option our planners would consider for the narrow sections… but it’s still not really all that awesome. Reducing traffic, starting to free up space – bikes both still ways, cars one way only. Enough space for an LRT stop AND footpaths. Option #3. Cars are allowed to travel in one direction (which side/direction would be determined by factors such as available alternative routes, and whether there are any destinations that would be difficult to provide rear lane service access to). By removing one car lane, we are able to widen the footpaths to something vastly more appropriate to a town centre. Then we can provide a unidirectional bike lane in the other direction (which can be a bit narrower, not being next to cars) to allow active modes to still travel in both directions. Sure, people biking in one direction would still need to ride on the road – but as we discussed above, it will be pretty easy to traffic-calm a section like this. Overall, a good solution, though still a compromise. The gold standard transit / bike / pedestrian mall in the centres. We can even add proper trees! Option #4 Now we’re talking! Not only would the removal of the general traffic lanes allow us to design really wide footpaths, add bike lanes AND a LRT stop right in the centre of the shopping strip – we would also have space for trees and landscaping. And it would actually feel like the centre of a community, with wide spaces in front of the shops, greenery and lots of space for people to move and rest. Would this be too radical? Some may feel so, especially on our very first LRT route, out of a concern that without a through-route for drivers, shops could not survive. The data shows otherwise. For example, only 2% of Karangahape Road’s customers park on the street itself: as on Dominion Road, those who drive to shop tend to park in side streets and parking lots. And remember, LRT will deliver enormous numbers of people travelling through the town centres day in, day out. With regular services, LRT passengers are much more able to hop out and shop (or come back another day to test that new restaurant they just spotted while going past). Much more so than drivers stuck in a car on a road that has no direct parking spaces anyway. For all these reasons – and, of course, because it would give people on bikes safe and direct access – we feel that this is what a real, best-practice LRT-enabled town centre on Dominion Road should look like. What about Hillsborough, Mangere and the Airport sections? This post has focused almost entirely on the Central Isthmus. So, what about the part of the route between Dominion Road and the airport, including Hillsborough and Mangere – especially with the pressing need to give South Auckland some bike love? The main reason we haven’t focused on those parts? As far as we know at this stage, and for better or worse, these parts of the route are much more likely to run along the motorways rather than on streets (main, or otherwise). So for those sections, it’s much more likely that any new bikeways will be a separated facility running in parallel, like those we already have in many parts of Auckland. And of course, along some sections of the airport route, these motorway-parallel bikeways already exist – both in ‘heritage’ form, like on SH20 (albeit many parts need improvement, especially at intersections) and in brand new form on SH20A, opened on Friday 22 June. So for now, it all comes back around to Dominion Road. Solve the really tricky bit, and the other parts will, if not fall into place, at least get a lot easier. How do we make sure Auckland gets the best out of LRT in town centres? Big transport projects like LRT can tend to swamp other pressing transport issues. But they can also – as with the massive Waterview Connection – provide an opportunity for brilliant strategic thinking, and creating connections for human-scale travel. People on bikes need safety and connection, even if (or especially because) we’re still a minority out there. The central isthmus already has higher regular bike numbers than the citywide average of 2%. And we know there’s enormous demand for local bike trips that is being artificially suppressed by the lack of safe bikeways. This is a huge, huge opportunity. Whatever is delivered for Dominion Road with LRT will be in place for 20, 30, maybe 50 years. We can’t afford to ignore what Auckland will look like in that time, and how children born today will want to travel as they become the adults of the future. We also can’t ignore the local and worldwide rush towards bikes as a savvy and strategic key element of city travel – nor can we ignore the growing local demand to provide for bike travel, safely and conveniently. This is Auckland’s chance to design a truly green corridor. The world will be watching. The main problem with so many of the debates surround making cities better for biking is that politicians need to change their view of "cyclists." People who bike are not a fixed number of constituents you need to placate, but an untapped resource you want to cultivate. We understand that the LRT project has now moved away from Auckland Transport proper (where, as we noted, it was extremely silo-ed, even within the organisation), and has now been taken over by other agencies of government to drive it forward, though obviously AT will remain in the mix. Bike Auckland will stay on the case – to speak for you, and for a future Auckland in which bikes are a key part of the picture. In the meantime, start talking bikes whenever you talk Light Rail. Because not only can the two go together – in clever cities, they’re a perfect marriage. Great post, Max, thanks. Option 4 is the only one that gets close to meeting the required dimensions for footpaths as per the (still draft) Transport Design Manual. It recommends 3m to 4.2 m for footpaths on streets like this PLUS 1.5m to 1.8m of tree pits. Buffer between cyclists and LRT doesn’t need to be as wide, but I’d still put one in. So the only change I’d make is reversing the position of the trees and the bikes. Why not protect the cyclists from the LRT with the trees? I fully agree with the need for prioritising the sustainable and space-efficient modes through this busy corridor. The busier the corridor, the more we need to remove traffic, so more people can access the area. You don’t need to protect cyclists from LRT, LRT literally can’t swerve into the cycle lane under any conditions (well, not unless something seriously catastrophic happens). Max’s design does show a little kerb between the cycle lane and the LRT lane which I think would be fine. In this case I’d say it’s better to a) use the trees where they can separate the fast moving bikes and LRT from the slow moving or stopped pedestrians, and b) put the trees where they can shade the footpath and cycleway well. LRT behaves, yes. Children on bikes can be random. As both a pedestrian and a cyclist with young kids in tow, I’d prefer the trees between the cyclists and the LRT. Hi Heidi – understand that concern. Not sure there’s a perfect answer under constrained situations. One benefit of having trees between bike lane and footpath though is that makes it much easier for them to spread out, without constantly needing to be trimmed back because they encroach into the LRT or vehile lane airspace. Right, I hadn’t really considered it that way, was being a bit adult-chauvinist. Is a kerb sufficient though, or do you need a big barrier like trees? A visual cue to avoid like a kerb will have some effect, though if you only have that much space a painted line might be better as it isn’t a toppling hazard itself? Not sure. But generally, I think you need toppling space for when the littlies suddenly decide it’s time to try cycling with their eyes shut (Yes, this has happened to me, with the little tyke almost immediately hitting a lamp post) and I think it needs to be a surface that doesn’t permit overtaking, because otherwise it will be used for overtaking, because brothers and sisters need to be sure they are where they want to be in the pecking order. I’d go with 70 cm at least of dense low bushes or hedges, or 1 m of raingardens in a depression… ideally, of course. Though I could see some concerns from LRT designers that this would make it too easy to enter the LRT section! 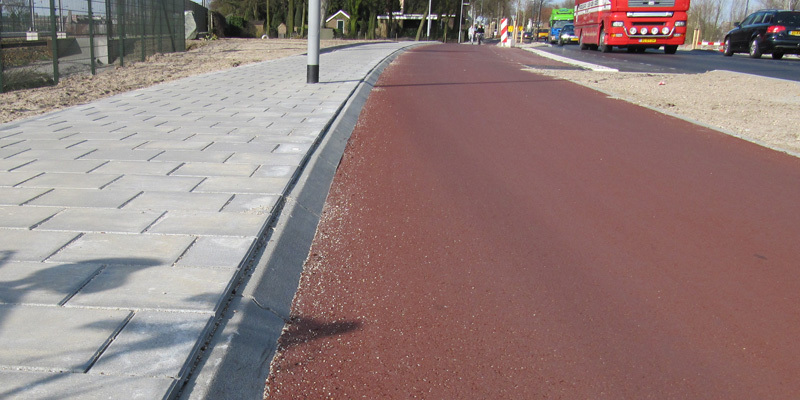 Maybe combine this kind of kerb with another vertical one above it – 10cm ramped kerb, to “deflect”, hopefully without toppling the bike, then 5cm vertical kerb above that to ensure you don’t actually ride into the LRT right of way? You won’t need rain gardens, ordinary planters are fine. LRT should decrease the amount of contaminated runoff due to fewer road vehicles so will make things better rather than worse. Minimum allowable footpath with in the draft TDM is 2.1m over short distances so the concept shown here is flawed. I would say there will be sections of Dom Rd where it could work but plenty where it won’t – and if you can’t have continuity it’s not worth doing. There may well be space north of Valley Road though right into the city. Re the TDM – would be good if the public could actually read up on these things, eh? AFAIK it is still not openly available? And this hardly means “the concept shown is flawed” or “wont work”. For starters, the footpath width could conceivably be 2.7m in the mid-blocks except at the trees, where we could use walkable tree grates (appreciate that . Also, as discussed elsewhere, we could see whether LRT needs all the 3.6m I have given it. or whether we can go narrower than 3.2m car lanes. Or even narrower bike lanes. if we want the mid-block footpaths wider. It’s what we value. I mean I could also argue that by not providing bike lanes (or bike lane with insufficient width), the concept of providing a road with general vehicle road lanes only is flawed. Because the TDM also requires bike lanes on arterials! But this is about finding a way to balance things, and I am quite certain it can be made to work. Do we *want* to find that solution? That’s the rub. We can always find reasons not to – or get serious and find a way. Well if your width is 20m or below (I posted a list of about 12 blocks where this occurs from the GIS map I downloaded) there simply isn’t enough space without land take. But I like the idea of no cars in the villages, that would be great. Good discussion Max. Thanks for the thinking. Like the offset station platforms to create space. Like the option of using one-way in places – Gold Coast does this in Surfers Paradise from memory. Like the advocacy for good bike access along the route. One question: all the images show 3.2m car lanes – is it possible to narrow those to 3m? Offset platforms can also work well with central islands, you have a pair of islands which face one side each. The benefit of this is your footpaths and cycleways stay straighter at the outer kerb. Houston of all places does this well. I’m pretty keen on the no traffic lanes option for the few town centres with a pinch, it seems to work so much better and traffic can still get around the back either side, albeit using a dog leg of side streets. I can hear the wailing and gnashing of teeth already, but at the end of the day that only inconveniences through traffic, people driving to or from the town centre, or to or from their houses along the way are pretty much the same. We just have to accept that Dominion Road stops being a district arterial and starts being a local street with a PT focus. Longer answer: I’ve started with 3.2m, because that’s the expectation (though as far as I am aware, not a mandatory requirement) Auckland Transport has for arterials in existing areas. And also because when you have a single lane in one direction, with kerbs on both sides, it gets a bit trickier for large vehicles like trucks who might service the properties along here, fire engines etc, maybe an occasional bus route doing an interchange loop that runs along one block of Dom Road before heading off again. Basically, when you have two narrow lanes adjacent in opposite directions (say 2.8m + 2.8m), makes it easier for that rare really large truck because he can edge a bit into the opposing lane to get past. With a single lane, no such option. But the short answer is: yes, there is some scope to go lower. I just didn’t want to be too optimistic at the beginning and create something easily rejected. Mike Hoskings will be sad. Misspelling / misprouncing names is a traditional form of disrespect. I am pretty sure he uses the royal plural all the time. Proposals such as this one would be much facilitated if we stopped pandering to cars and those who insist on driving them everywhere, everywhen. A good start would be to ban all on road parking. We must accept that a road is a communication route, not a parking place. Many people certainly will be inconvenienced – all the more reason for them to embrace public transport. In the longer term, once a comprehensive public transport system has been implemented, we should aim to remove all cars from all roads. I think you will find there will be zero car parking along Dominion Road. I like your ambition! You may want to check out Beyond Car Culture, Aotearoa on Facebook/Twitter. Excellent post. Great work Max. Really important points being made. Now that NZTA is in charge as the funder of the project, expect nothing much to happen until National comes back in and cans the project. If in the off chance NZTA starts actually doing something, it will probably be the total opposite of what you are suggesting. Unfortunately, the only way this will happen is with a very popular campaign for it to get the pressure on. Excellent article, and I shall be reviewing FIT Wellington’s proposals for Riddiford St on the strength of it. But what about an option 3a, or 1a for that matter? Use an island platform, and move the diagram-left tram track into the traffic lane. Motor traffic is stopped by traffic signals when there is a tram at the platform, but only for a few seconds. A typical dwell time is 15 seconds. Overall, zero motor traffic delays should be practical. It will need care to keep the platform clear of queuing cars, but good coordination of the platform and downstream traffic signals should be enough. The next signals downstream can also have a right turn lane on the tram tracks, arranged to clear all cars before a tram arrives. Or are there too many hostages to fortune here? I think option 2 and 3 are entirely workable. As we would have replaced most buses on the route with LRT, the roadways left could easily have speed tables (footpath height zebra crossings to connect to LRT stations even). Key is also significantly reduced traffic volumes. Tree pits with raingardens feeding them is a big step forward over what some city trees get. But if we’re designing from scratch, we should try to provide our city’s trees with an environment that allows them to be resilient in the face of new environmental pressures. Diseases and pests are heading this way, with climate change and biodiversity loss. If there’s a choice between different options, I’d go with the full strip of planting mimicking a more complete ecosystem over paving-surrounded trees any day. Fair comment – though the mid-block trees (=90% of the street) would at least be planted in a linear strip of “open green” (see first cross-section). Not as wide as in a perfect world we would want it, but space for some variety, other plans in addition to trees etc. Good discussion thanks. Interesting the YouTube videos on driving with trams Melbourne. They have hook turns for turning right across the team lines, just like with our bike turns. The problem is there is not sufficient width on the Dominion Road corridor to add proper bike lanes without significant land take. That would slow the process to a crawl unfortunately. It would be almost impossible to route bikes through the villages without having to rebuild all the shop fronts. That would be way too expensive a proposition I imagine. I guess you could change the law and allow bikes to use the footpaths everywhere but high speed cyclists may prefer the road still, as it will be protected from cars and buses overtaking too close. Who’d be crawling in option 4? There’d be a more efficient flow of people through there than in any other corridor in Auckland, for its width, wouldn’t there? Responding now properly to your comment, Max’s options don’t involve land take… they involve road reallocation to public and active transport modes, as per Goff’s instructions to AT. Sorry I meant the approvals process. So many more stakeholders if you start big land takes. Should have been clearer, sorry. Sorry, but I wonder how much of the blog you read. None of the options I discuss uses ANY land take, or requires rebuilding ANY shop. As for the rest – bikes or not, every single square metre of Dom Road will be dug up and rebuilt as part of this project. Every single one. That’s what a major streetscape change does. So adding bike lanes into the design doesn’t change that at all. It’s only about how we balance the results of that work between traffic modes. You are assuming too much width mid-block for Dom Road – much of it is below 20m wide if you download some GIS maps. I think lots of people like the idea of no cars through the villages though, that would be beneficial if NZTA can be convinced. Pretty sure you are incorrect, nowhere is the road corridor less than 20m wide on Dominion Road according to my GIS. Are you sure your not measuring the width between the kerbs, rather than the whole road corridor? I will try this post again. Measuring between parcel boundaries not kerbs (please don’t assume I don’t know what I am doing) there are 12 blocks where the width is around 20m or below. Starting from Marsden Ave and heading north to View Road. I named them in another post but it didn’t go up for some reason. So what do you propose to do in those instances? How many were more than 25 cm less than 20m, Jase? And how much less? A slightly narrower footpath at some pinch points wouldn’t worry me. 20m is sufficient, if snug, for two LRT lanes, two traffic lanes, Copenhagen cycle lanes and footpaths. If you’re not happy with winding them all down to minimums, you could widen by a metre or two each side. Outside of the town centres there is a roadwidening designation in place along pretty much the whole length of dominion road. What values are you using, Nick? Lrt 3.6m, car lane 3.2m, bike lane 1.8m, minimum buffer 0.3m?, this leaves footpath 1.1m, which I know you wouldn’t consider to be sufficient. 3.5m LRT, 3m traffic, 1.5m cycle, 2m footpath. I did say snug! If only this sort of snug meant comfortable! 🙂 It’s too snug, and could raise the spectre of conflicts between modes. Nasty accidents which will always be blamed on the lrt, or on the cycle lanes, instead of on having to keep the traffic lanes which was the reason for it being too snug. Let’s try to avoid that. Which actually means land-take is out, too. If the problem was only in a few spots where the width drops below 20m, then land-take might be a solution. But since 20m is insufficient (too snug) then we’re talking about quite long sections needing land-take. Far better to go with a consistent message that we can improve urban form and people-flow without land-take, by reallocating road space away from the land-inefficient dominant mode. Or, putting it another way, the message needs to be: with a corridor that is often 20 m or even narrower, we CANNOT fit lrt, traffic, cycles and footpaths. Since one of these needs to go, and as cyclelanes are needed for the many reasons Max has given (including that they are specified in the TDM) then the one that needs to go is traffic. AT’s and Council’s documents show consistently that they are trying to shift mode-share away from driving, and they’re trying to provide safe, connected networks for the other modes. Our message needs to be consistent that the traffic must go, and we can’t fit it here. I think that is an impractical stance, unfortunately. In a couple block of the town centre you can remove traffic lanes, because those bits don’t have any driveways or traffic accesses. But along the length of Dominion Road outside of the shops it’s liked with houses and driveways. It’s just infeasible to not have traffic access to these houses. So in that mind that means one lane each way for traffic (albeit not necessarily a wide or fast lane) is the minimum. I don’t actually see a problem with my proposal above, it would be an improvement over the status quo for most of Dominion Rd which has about 2m footpaths and no cyclelane. So the obvious fact is that the corridor is just not quite wide enough. Land take is probably not a serious option either. So maybe just put the LR sbove the road, elevated on Dominion Rd and grounded where there is not a surface space problem. No, I am pretty sure I am not. I used AT’s own, public documents from the bus corridor project, as well as various cross-sections that i was given for my Cycle Action work at that time. The typical mid-block is given multiple times as 22.6m. I am not, of course, assuming that this is the narrowest, which is why I spend a lot of time discussing the 20m which were given as typical town centre sections. I think, village centres excepted (where the building line is often on the boundary) there is scope for land take for most of the other property. If we lose traffic from the village centres that would solve that problem anyway, and for the rest it would mean probably less than a hundred properties having a metre or so shaved off their front gardens. But I don’t know how much that would complicate or delay the process – I suspect AT would have been trying to affect as few properties as possible with their original design. I do think it’s a bit of an opportunity wasted not to include a proper separated cycle lane along the length to tie in with the Ian McKinnon work, but who knows how NZTA will see it – it’s in their court now I believe. There needs to be zero car parking along EVERY road. Meh. I’m not anti-car. They have their place. But not at the top of the pyramid, particularly not in an urban situation. What if you don’t have off-street parking at your house? Don’t tell me not to owh a car because that is completely unrealistic, even if it’s not used for commuting. That is entirely the problem of the landowner, no one else’s. I don’t support removing all street parking as I think it has significant benefit to traffic calming on many streets and there is a benefit of providing shared visitor parking. However, this should only be if parking doesn’t compromise a road’s primary purpose of facilitating movement and access for people. No one should expect access to street parking, it is merely a bonus if it can be provided. I agree for arterials but not for urban side streets. But as you say, even on arterials parking does provide traffic calming but realistically you could do better putting bike lanes either side. On urban side streets at low densities, householders can be expected to keep their cars on their large properties. On urban side streets at medium densities, householders can be expected to have few cars, and to park those in the few carparks provided as part of the complex. The difficulty is during the process of change between low and medium density form while people are still getting their heads around it. But the legal situation is clear: householders have no right to parking their cars on the public road corridor. It’s a bonus if they manage to, not a right. And if there is more demand for the parking than there is supply, it should be managed, including with price. 10% of Auckland households don’t have a car at all, it’s hardly unrealistic. But yeah, at the end of the day buying/renting/living in a house without on street parking is your choice, it’s not the city’s role to provide you with residential parking on public land. Worst case you might have to walk a block to another street. This is a great proposal. Thank you Max. Who do we have to petition to get Option 4 in? Bearing in mind that it will take some time to build this – AT could start closing the road in one direction already during construction and just leave it that way. We’re currently setting a campaign up for that, with some help from others! Our guess is that even the design and approval will take some more years, so in some ways there’s still a lot of time. In some others, time is running out, because the more the design proceeds, the harder to change tack later and add in bikeways! I am told the reference design has already been done. We are well aware a lot of work has already occurred – we have been trying to get into contact for well over a year after all. If AT has handed over the design of a road corridor that is not a state highway to NZTA, that doesn’t excuse either organisation from proper engagement with the local boards. Not sure whether any Local Board involvement has occurred so far. Do we really need 3.6 for LRT even, could 3.3 be enough? My understanding is that Austroads gives minimum 6.6m for both lanes. Bit off topic but I quickly checked through Broadway Newmarket & seems ~25m south of Kyber Pass Rd but then a tad over 20m north of that. Khyber Pass itself is ~20.2m. Just thinking future full time bus lanes or light rail with cycling through there as well (of course bus needs to be wider than LRT). Is it really ‘completely unrealistic’ not to own a car? The idea that it is underlines the need for a comprehensive public transport system, one that serves ALL the travel needs of ALL the people. In response to questions about Local Board involvement – there has been no real involvement except at the very highest level – detailed design around the Town Centres and stations (which absolutely must involve the affected Local Boards who have legislated responsibility for local place making) has yet to occur. I am particularly alarmed by proposals to close the Town Centres to half or all of through traffic which may solve some problems but will surely create others. Given that Dominion Road has been accepted to be the primary North-South corridor through the middle of the isthmus since major consultation over 20 years ago (the Central Isthmus Corridor Study) – where exactly do people imagine that the current traffic on Dominion Road will be displaced to? Do not imagine that it will somehow just go away, although a small percentage may. Albert-Eden Local Board has put considerable effort and money into persuading rat-runners and other through traffic away from our residential back streets (through traffic calming) and back onto the arterials where they belong. Yes we could divert some to the parallel arterials (Sandrigham, Mount Eden and Manukau Roads) but they are already fairly busy and have their own local town centres already struggling with disturbance and severance effects of through traffic. Have you studied cases of traffic evaporation through road removal, Graeme? A small percentage of traffic being diverted is more likely than a small percentage of traffic evaporating. Examples in Los Angeles, Seoul, Barcelona, Paris, many more… Don’t forget that the number of people who can move through this corridor is increasing, just not their metal boxes. +1 for dead end and one way streets. Wish they would do that in my part of Albert Eden. It worked wonders in London. Can dead end them just for cars and allow walking and cycling through. •	Street layouts should support pedestrian, public transport and cyclist catchments. All good stuff, AT. Just looking forward to it being implemented. That was a neighbourhood that was totally set up for cars but transformed into a cycling/walking haven by just cutting off some roads. Now that we have the Roads and Streets Framework, I wonder how streamlined we can make the process to recreate our roads and streets as fit for purpose? Oh great, now we’re going to have the local board ‘championing’ for through traffic speeding through dominion road as priority over transit access and great centres?! Oh no, won’t somebody think of the cars! Ok sorry, but snarky there…. But a twenty year old road hierarchy plan that designated dominion as a district arterial, is that really a bedrock decision we need to stick with? Have we not moved on since the 1990s, about the darkest days in Auckland’s urban history. Auckland has or is preparing to remove the arterial road assumption from all sorts of streets, not least Quay, Queen and Victoria. Why not three blocks of Dominion too? Another point is the transport network has changed hugely in twenty years, and will change further. We have the western ring route motorway and waterview for a start. Why is anyone driving from mt roskill to eden terrace that way still? Also if the install a two billion dollar rapid transit system, are you really going to wring hands over a couple hundred drivers using dominion road as a rat run to avoid the motorway, when the LRT will be moving five thousand people an hour? Do note that if you did close two or three blocks to traffic in the middle of the town centres, locals would still be able to use dominion road to drive around their neighbourhood, and they’d still be able to drive to or from the centres themselves. All you’d be doing is making it less convenient to drive through from one end of Dominion to the other. An arterial except for three blocks isn’t an arterial, just like a bikeway that doesn’t exist at the tricky intersections on its route isn’t a bikeway. Trying to minimise the apparent impact by referring to three blocks is dishonest, regardless of the strength of other arguments. It’s not dishonest, and I don’t agree with your premise. For example, if they wind down Quay Street to traffic in front of the ferry building, it doesn’t stop it being an arterial road between The Strand and the port entrance at Tangihua Street. Likewise with Dominion road, if they eased back traffic priority through Balmoral shops, it wouldn’t stop it being an arterial between Balmoral road and eden valley. But I must say I don’t particularly care, the easiest thing is to stop calling it an arterial and expecting it to be one. Problem solved. For the town centres, would it not help if the stops were placed at points where there are currently bus stop pull ins, where the road corridor is wider? For instance northbound at balmoral shops, the buses pull over on the left outside of the buslane. This is outside 583 & 591 dom rd, where the buildings are set further back from the road giving extra width to the corridor. Likewise southbound at this point there is an extra lane affording 2 lanes + a parking / bus stop lane. Maybe not anything like that, for example what about a dogleg northbound onto wiremu then the lane between the shops and McDonald’s, and southbound through the old warehouse carpark to dog leg through rock lands. Only needs to be one block, and the diversions only need to be one lane, one way each. Well aware that any diversion would be an extremely touchy subject. We did acknowledge that it would be a “bridge too far” for many. It’s actually an opportunity for AT to frame it in terms of access for people, and to sell it to the locals as genuinely good outcome for them. Which is why I would expect (and support) that this whole project goes to EPA as a direct referral, just as the RONS projects did. From my personal experience as a participant for advocacy groups in two such processes (Waterview and East-West), this provides a (reasonably) even-footed and balanced approach that allows all groups (not just the applicant and those groups financially well-enough to afford specialists) access to the decision-making (though you are of course still better-represented if you can hire experts :-/ ). And once the decision-making is done, it is (again, reasonably) un-appealable, providing certainty and ability to proceed and build. If it’s done with a bunch of separate consents at Council hearings, and then appeals, we’d be in Environment Court till 2032 anyway. This is precisely why we must stop giving cars first priority in transport, with all other transport modes getting only what is left once cars have had everything they want. Rather, we must provide for all other modes of transport, then let cars have anything left. If there is nothing left for cars, then, no cars. If you have a problem with not being able to use a car, then that is your problem, not mine or anyone else’s. What would happen if the motor vehicles were one way only on Dominion and Mt Eden Road? Fairly hard to do one way with the LRT, basically means getting into driveways down one side of the street means driving over both tracks. Dominion Road was built with a 20.1m road reserve or 1 chain (or 66 feet). When the locals got the Central Motorway killed off in the 1970’s the Councils put in building line restrictions on either side to allow for widening as sites were developed. So you will see some newer buildings built set back and plenty of old buildings still sitting at the 20.1m mark. There is no way to get light rail, platforms, bikes, cars and pedestrians into that width so as the poster says you have to leave something out or do the job properly and widen. If you leave something out then I am sure there are plenty of readers here who would leave out cars but how the hell will you get access to the existing homes and business accesses on Dominion Road? Widening at least gives you the option of providing safe crossing points or fencing the tracks to make it safe. Oh and the building line restrictions? The locals got them removed in the 1990’s so now you have a varying width. Thanks for that, mfwic. Am I right in imagining the 1 chain road reserve width was common throughout Auckland? If I am, then this issue is one we do need to deal with properly, as we’ll have it throughout the city, whether for bus lanes or lrt. I wonder if the designers are considering placement of the stations where land-take is most possible, ie where the newer buildings are set back, and (only if absolutely necessary) beside modified buildings that have had their character removed in bland renovations? Doing a complete streetscape remodel like this and NOT providing safe cycling infrastructure for all levels of confidence seems to me to be a complete cop-out in a situation that will repeat over the city. Many properties throughout the city don’t have cycling access, in any safe sense of the word, and that’s an inequity that must not be continued. Give those locals who want to retain car access the option of elevated light rail, with the extra cost thereof added to their rates. If they object, remind them that light rail is trams uodated, and that trams were abolished, in the 1950s, in part at least, because tram tracks interfered with cars. Pay back time. Except you can’t. The Council can’t approve a subdivision without access to each site. Similarly they can’t remove access without due process and compensation. So it won’t happen. More likely is they simply leave out cycle facilities, not because it is right, because it is easier. So the RASF and the TDM can prioritise cycles above vehicles wherever they like, there is no legal basis for it? You can prioritise one over the other but you can’t deny access. At least not without a process and probable compensation. Remember these sites all had full access back in the days of the trams because the tracks were a shared space. The AT plan is to push bikes into a narrow traffic lane like it’s 1982. They are going with that option because it is the cheapest. So what is the solution? If ‘access’ is limited in definition to access by motor vehicle then much of the city will never have safe access by bike. Minimising building demolition is important in a world of limited resources, so even if they do some for this project, it’s hardly viable for all the projects throughout the city. Can ‘access’ for motor vehicles be provided on a “apply for a permit” basis, during certain hours of the day or night? I think it predates cars. But regardless of that think about how you get access to a house or business for deliveries, for emergency services or even a furniture truck. How do you take rubbish away? If you really want to take that away on Dominion Road then the answer is to build a new access lane to each of those properties at the rear and include that in the cost. Showing a road with all traffic removed is just a dog whistle for greenies so they can all cheer. But nobody is going to be daft enough to actually do it. Let’s face it getting LRT in is going to be hard enough already. Put that cross section in the consultation and it will be a lost cause. The whole point of elevated light rail is that it allows continued full use of the road. It also means that it need not be constrained to follow the road. Reducing car traffic is a feature not a bug of this project. Elevating over the the road is impractical, the support structures and the stations will require much more land and be hugely expensive. You need to take away about the same amount of space to have the pylons holding the rail up, and the barriers protecting them, as you would just putting it in the street. And there is zero chance you would consent an elevated station hanging over those town centres. As for not following the road, then you are in the realm of buying and demolishing a 7km long swathe of houses across the isthmus. About 250 houses would be required, maybe a third of a billion dollars in land acquisition even if you could feasibly consent and undertake such a thing.